Most widely known and grown of the Hardneck variety. These plants are not as tall, but wide with green/blue leaves and scapes that complete a double loop. Bulbs with white or white with purple wrappers and reddish brown skins. Rather large bulbs typically have 6 to 10 easy to peel cloves per bulb. Rocamboles mature and harvest in early to mid season, when leaves turn from dark to light green color. 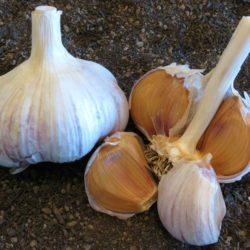 A favorite to many garlic lovers due to its tremendous earthy and true garlic flavor. Most are fiery hot when eaten raw. Expect shorter storage time.